"Lucca Ravioli" How can you NOT love a place with a name like that? Yes, I sell wine for a living and I write about my products here on this site. I am proud to represent the products in AI Selections portfolio. In my opinion, it’s one of the most interesting collections of imported wine around- that’s why I took the job. In our industry it is customary that a salesperson “supports” her own products in her accounts. This means we drink our own wines- wines we have sold into these restaurants and wine bars. The funny thing is, for the first time in my career I feel absolutely NO pressure to do this. AI Selections was founded by David Weitzenhoffer, former Wine Director for Felidia in NYC. If anyone appreciates the fascinating diversity of the wine world, and recognizes the sheer importance of knowing as many wines as possible, it’s David. Consequently, I do not feel I HAVE to order my own wines in our accounts. But most of the time I still I do. Because I love them. I especially excited about a new listing at Sotto in Los Angeles. 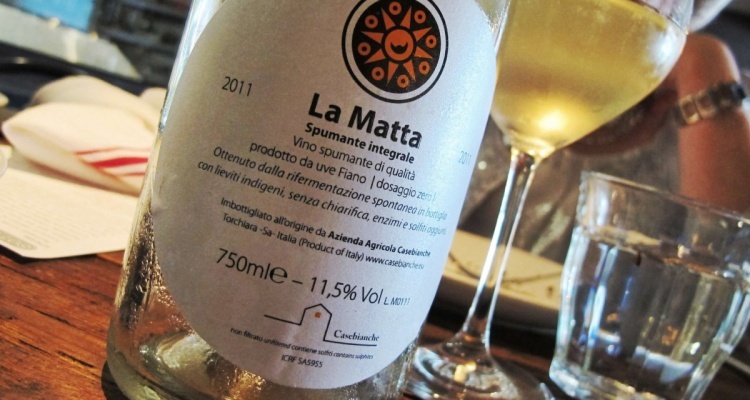 Casebianche’s “La Matta” Fiano is a naturally sparkling, unfiltered, unfined, and generally delicious. Crunchy-saline-minerality. The truly unpretentious side of Fiano. “La Matta” is the perfect, refreshing foil to this rich, chicken liver pasta at Sotto. Drink this wine- I think you’ll like it too! Great meal, great company. Great wine! That was so epic. I am STILL FULL. The food you’ve chosen to include in this post only makes me think that the wine has got to be the icing on the cake here. I loved that meal. The pasta with the chicken liver sauce was amazing. Good choice grasshopper! Thanks dad. There are so many more amazing places in LA! You guys need to come back on a restaurant tour.